One Step Forward and Two Sideward. After the “failure of Copenhagen”, the UN climate conference in the following year, COP16 in Cancun 2010, has raised new hopes: the international climate diplomacy does not collapse. But the results of the conference show a mixed picture. In some areas, progress has been made, however, in other dubious compromises were found. 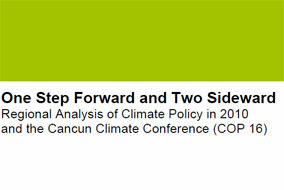 In this climate policy analysis “One Step Forward and Two Sideward“, Tilman Santarius together with colleagues from seven other countries show what has been achieved in 2010 in the national climate policy of important key countries, and what key outcomes have been realized at the UN climate conference in Cancun.